A video is spreading like wildfire through the various motorcycle web forums and shows a German TV company allegedly filming the advantages of a motorcycle fitted with crash proof “warning” systems. The system fitted to the bike includes a computer that monitors the motorcycle’s environment using video feeds and distance data. The system constantly searches for hazards including vehicles and pedestrians, identifying thousands of potential dangers including a sensor that identifies if a driver has seen the motorcyclists at a junction. 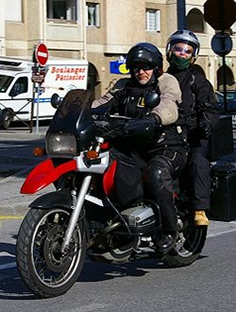 The hazards are transmitted to a receiver on the rider’s helmet with a head up display (HUD) inside the helmet which shows the rider where the danger is. The video report includes a demonstration which starts with the motorcycle aiming to ride towards a junction where a car is waiting to pull out. The system should then activate the sensor to warn the rider of this potential danger. According to the commentator, the footage would then be downloaded so that the viewer can see what the rider saw. The rider sets off and the video shows what happened next. The system appears to be similar to already developed including those in the PISA – Powered Two Wheeler Integrated Safety project www.pisa-project.eu the Saferider project www.saferider-eu.org both part funded by the European Commission. There is a caveat. We cannot guarantee that this video is real thing or a spoof. Either way it is very clever because it demonstrates what we have been saying about Advanced Rider Assist Systems (ARAS). Technology that creates reliance on warning systems i.e. external communication between the rider, the motorcycle, road infrastructure and other vehicles (e.g. 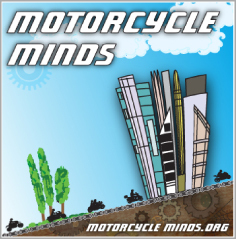 vehicle to vehicle communication) with the objective of improving motorcycle safety may help, but they will never substitute good common sense and attention to the road. At Right To Ride we have continuously said that focussing on the human element could be a far more cost effective and longer lasting solution than relying on these systems to save lives.